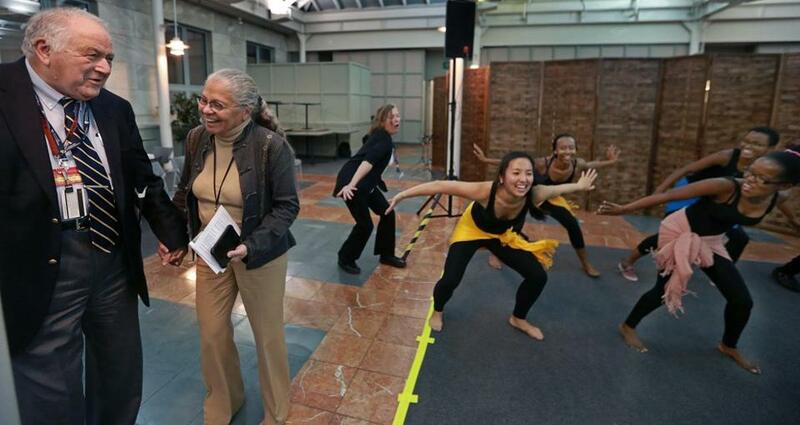 Dr. Ronald Arky and Dr. Nancy Oriol joined the fun at a recent Harvard dance event that was part of the school’s humanities Initiative for physicians in training. to gaze at paintings or play the viola while they’re cramming for anatomy tests. But Harvard Medical School thinks students should be doing more of that — and the school is not alone. This fall, Harvard launched a new initiative to use more drama, dance, and literature to help medical students become empathetic and reflective doctors. In doing so, Harvard joins a growing number of schools making more overt efforts to weave arts and humanities into medical education. The Yale School of Medicine, for instance, requires students to scrutinize paintings in a museum to improve their skills at observation and empathy — a program that has been replicated around the country, including at Harvard and Brown. At Columbia, incoming medical students are required to complete a six-week narrative medicine course. They can take classes in fiction writing, obituary writing, and visual art. At Penn State College of Medicine, the first medical school in the country to create its own humanities department, students can take a comics and medicine course to fulfill a required humanities elective. These kinds of programs are now spreading to more medical schools. “There is, on a national level, increasing support for this kind of activity,” said Dr. John Prescott, chief academic officer of the Association of American Medical Colleges. The arts have not been absent from Harvard’s medical campus, where students play in a popular orchestra and produce a literary magazine. But individual professors have been promoting the arts “in the dark, on their own,” said Dr. Joel Katz, a Harvard Medical School associate professor who takes students to Boston’s Museum of Fine Arts to hone their observation skills. Now, he said, the Arts and Humanities Initiative — which includes arts-themed field trips, an artist-in-residency each spring, monthly events like open mic nights, and a collaboration with Harvard’s American Repertory Theater — has coordinated existing efforts and expanded them. Efforts like these don’t aim to make doctors into artists, said Dr. Kenneth Ludmerer, a professor of medicine at Washington University School of Medicine who studies the history of medicine. They are “a tool to help doctors understand people and their conditions.” They help doctors see beyond the disease, the “narrow biological aspect,” to the illness, which includes anxiety, fear, and the whole human experience of being sick, he said. Medical schools started introducing ethics and literature into their curriculums in the 1960s, Ludmerer said. In the last decade, the movement has accelerated and broadened to include sociology, music, and most recently, art. That’s taken place partly as pushback against the growing specialization of medicine, combined with technological advances, that make doctors “cursingly narrow in their vision,” Ludmerer said. Despite the competing pressures — “standardizing care, technologizing care, quickening care, streamlining care, fragmenting care, sub-specializing care” — the medical humanities movement is gaining more institutional support from medical schools, said Dr. Rita Charon, executive director of Columbia’s Program in Narrative Medicine. She is working with several universities, including Dartmouth, McGill, and the University of Southern California, to incorporate arts and humanities into their medical programs. Research has found that physician empathy improves clinical outcomes for patients — but that empathy declines as students go through medical school and become desensitized. Museum-based observation courses do improve students’ visual diagnostic skills, studies show. But more evidence is needed to show that programs like these also improve students’ empathetic skills, said Dr. Horace DeLisser, associate dean for diversity and inclusion at the Perelman School of Medicine at the University of Pennsylvania. His school is piloting a museum-based training course for students and conducting a scientific study to evaluate its impact. The study includes measuring whether the course improves students’ ability to recognize the emotions in photographs of actors’ eyes. Besides building empathetic skills, Harvard’s arts program aims to help students process the human tragedies they’re exposed to in medical school, said Dr. Lisa Wong, a pediatrician and musician who is helping to lead the initiative. Harvard’s program is starting on a small scale, with some seed money from the dean’s office and outside donors, and optional events instead of required course work. The Arts and Humanities Initiative’s first event of the year, on a rainy Wednesday night in September, drew just a handful of medical students. The occasion was a dramatic reading of Margaret Edson’s play “Wit,” about an English professor’s experience undergoing chemotherapy for metastatic ovarian cancer. Organizers put on the play to generate reflection and discussion about how hospitals treat — and mistreat — patients with their words and attitudes. Two medical students performed alongside drama students from Harvard. In a post-play discussion, Ivana Viani, a third-year medical student who performed in “Wit” two years ago, said the experience stuck with her as she moved into a hospital setting. One day on a clinical rotation, she said, she found herself standing by a patient’s bedside, presenting his case to a medical team. Radiological evidence had just shown the patient was very likely to have cancer, but Viani didn’t want to say the “c” word until there was a biopsy because the play showed her how powerful that word can be. “The attending [doctor] just interrupted me and said, ‘You have cancer.’ And we just left,” she recalled. Melissa Bailey can be reached at melissa.bailey@statnews.com. Follow her on Twitter @mmbaily. Follow Stat on Twitter: @statnews.